According to the IHRSA Health Club Consumer Report, 6.4 million Americans use personal training. Although it may be a small percentage of all Americans, about 10% of health club members are personal training users. Our profession plays a critical role in helping people lead healthier lives and reach their fitness goals. Personal trainers offer guidance, education, encouragement, and accountability. We change lives! In spite of this, the value of personal training sessions doesn’t exactly match up with the vital role we play in our clients’ lives. According to the IHRSA Health Club Consumer Report, consumers indicate paying an average of $52.97 per personal training session. Even though this may appear to be a good rate, this fee does not go directly into the fitness professional’s pocket as the club assumes as much as 60-65% of the total fee. This leaves the trainer with an hourly rate of $18-$21. Yes, it’s still better than minimum wage, but definitely less than what your time is worth given the knowledge and service you provide. In order to solve this problem, most trainers strike it on their own, often starting with home or mobile training as the beginning of their independent enterprise. Mistakenly, trainers will charge much less than what the club charges a consumer, often too little. Charging clients a few dollars less than what a club charges may be a good business decision to best your competitors on a pricing basis. But reducing your fee to as much as half the amount of what a club charges only undervalues the service you provide. Conducting a session outside of a club doesn’t mean the training product loses it’s value, so it’s important to ensure your fee reflects value for your time and expertise. Health clubs use a variety of qualifications and requirements — both intangible and tangible in determining what to charge for training. Try to keep the following considerations in mind as you develop your own fee structure. Before establishing your fees, it’s important to develop the right mindset. Keep in mind the value of your work: personal training is not a low-cost club concept, it’s a premium service you offer in efforts to improve the lives of others. In fact, many low-cost clubs do not offer training at all, considering it a premium beyond the basic offerings common in an express fitness center. Once you have a healthy, confident attitude towards your craft, consider your unique qualifications and expertise. It used to be that not all clubs nor clients require or expect a college or advanced degree for personal trainers. Although a college degree is not necessarily required, having some formal education that attests to your knowledge of training, exercise science, and health psychology is a good feather on your cap to promote to potential clients. Do you have both a college or advanced degree and personal training certification? If so, be sure to keep this in mind as you set your fees. Also, once you’ve become an independent trainer, it’s your responsibility to maintain your personal training and CPR/AED certifications. Hold yourself accountable in completing the continuing education training required for both and remember to re-certify. It’s not uncommon for clients to pay more for a specialty fitness professional. Consider additional training in any of the following specialties and set your fees accordingly. Pilates or Yoga – Although many exercisers may sign up for a group Pilates or yoga class, some prefer to work with a private instructor. As Pilates or yoga instructor and personal trainer, you will need to devote time to staying up to date with techniques and trends for both Pilates or yoga and personal training. Keep this in mind as you set your fee. Youth fitness – As a personal trainer working with children and youth, you play an active role in helping solve the obesity epidemic and instilling healthy habits at a young age. Working with youth requires specialized programming and considerations. Pre & post-natal fitness – If you plan to work exclusively with pre and post-natal clients, then be sure to promote and price your services accordingly. Working with this population calls for additional training skills and expertise in pre and post-natal health. Sports-specific – If you aspire to focus your expertise on sports-specific training for an athletic discipline, price it as such. Being proficient in program design and coaching for athletes requires a specialized skill-set. Many sports-specific training sessions can run from 60-90 minutes. Be sure to set your fee structure accordingly. Senior fitness – Older populations typically have distinct goals for fitness in comparison with their younger counterparts. Training for post-rehab, overall health, balance, and coordination are important to this segment and requires specialized expertise on your part. Home and mobile training provide a convenience clients do not have with a traditional club setting. Many trainers will set their fee less than what clubs charge once they strike it on their own training people at the convenience of their own homes. But when you consider drive time, transportation costs, and perhaps even wear and tear on your own training equipment, the value of a home training session can exceed that of an in-club training session. Do you offer online training or remote coaching? Some clients may need more accountability beyond a one-hour training session. If you are thinking of offering coaching calls on an individual or group-basis, set a separate fee for this service as it is conducted outside of the traditional training session. Just like clubs sell personal training sessions in packages of several units at a time, you can continue to offer this on your own. For clients that sign up for a series of sessions ahead of time, you can extend a discount comparable to what clubs offer. However, try not discount too much as it may undermine the value of your craft and possibly disincentivize you from offering a long-term commitment to clients. 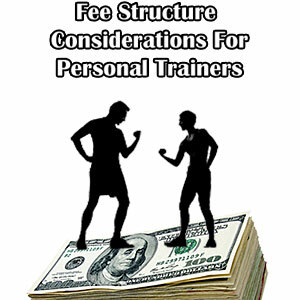 Your personal training fees are ultimately your business decisions. Consider your education, expertise, and unique offerings in efforts to establish a competitive and fair price. Remember to value your craft and keep in mind the indispensable role you play on the health of many! Website: MyExerciseCoach.net IdeaFit: Melissa Rodriguez Melissa Rodriguez is a personal trainer, strength & conditioning coach, and fitness industry analyst. Melissa coaches committed exercisers and keeps a pulse on consumer and business trends in fitness and sports participation. She is a certified personal trainer through the National Academy of Sports Medicine, strength & conditioning coach through the National Strength and Conditioning Association, and manager of research for the International Health, Racquet & Sportsclub Association. With a special emphasis on obstacle course races, Melissa’s website, MyExerciseCoach.net has training tips, reviews, and activity news. Although content is often focused on beginners, advanced athletes will also find valuable tips and insight.